This Valentine’s Day Hershey’s has some great candies that are inspired by love to give your sweetheart. Reese’s Pink Peanut Butter Hearts think “pink” and taste the perfect combination of pink crème and classic Reese’s peanut butter in a fun heart shape. These treats are individually wrapped, making them perfect for candy dishes or gifting; Available in 10.2-oz. bags (SRP $3.99). Reese’s Peanut Butter Cup Miniatures Cane show those close to your heart how much you care for them with Reese’s Peanut Butter Cup Miniatures Cane with a heart-shaped cane topper; Available in a 2.79-oz. bag (SRP $2.49). Jolly Rancher Jelly Hearts Valentine’s Exchange show all the sweethearts in your life you care with Jolly Rancher Jelly Hearts Valentine’s Exchange; Available in a 15-oz. bag with 25 pouches ready to be personalized for all your Valentine’s this season (SRP: $5.99). These are the ones I got for review and they are so good I love Reese’s anyways and the Pink Peanut Butter Hearts is a great touch for Valentine’s Day along with the tasty Jolly Rancher Jelly Hearts in the flavors watermelon, strawberry and cherry. 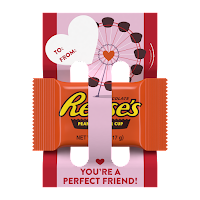 The Reese’s Peanut Butter cup Cane is perfect for gift giving. I loved all that was sent to me. 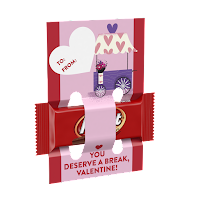 Reese’s & Kit Kat Valentine’s Exchange with Cards adds a sweet treat when telling the special people in your life how you feel. 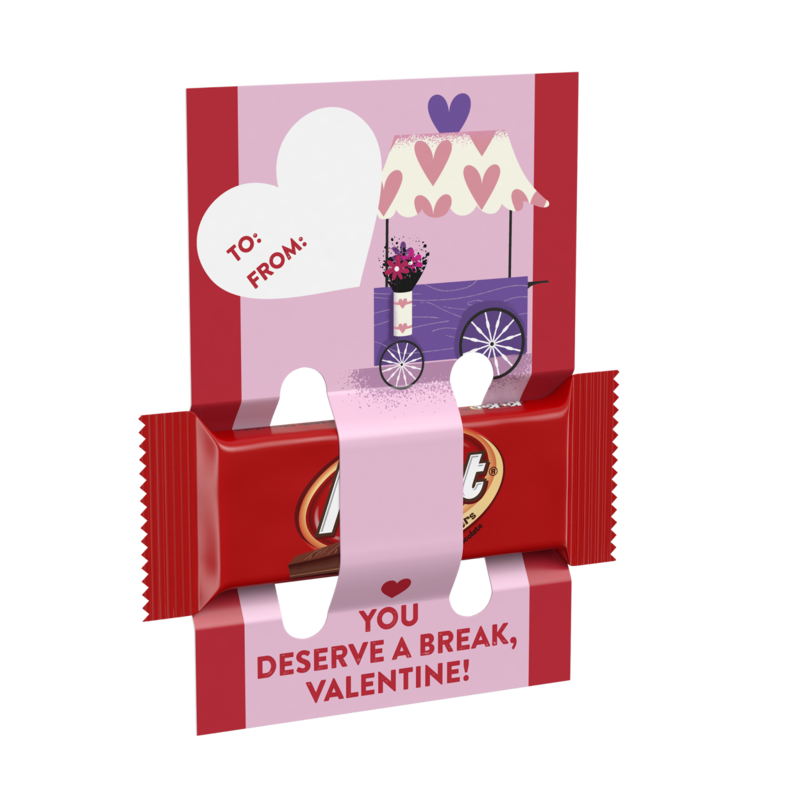 Include either a Reese’s Peanut Butter Cup or Kit Kat miniature, ideal for office or school Valentine’s exchanges. Available in 13.68-oz (SRP: $5.99). Reese’s Peanut Butter Cups Football or Basketball Heart Box a sweet treat for any sports lover with Reese’s creamy peanut butter and smooth milk chocolate in either a football or basketball themed heart-shaped box; Available in a 7.1-oz. box (SRP $4.99). Hershey’s Nuggets Milk Chocolate with Almonds Heart Box show those close to your heart how much you love them with Hershey’s Nuggets Milk Chocolate with Almonds available in a heart-shaped box. It’s something everyone in the family will enjoy; Available in a 7.4-oz. box (SRP $9.99). Hershey’s Nuggets Special Dark Chocolate with Almonds Heart Box for your friends and family who love dark chocolate, gift them Hershey’s Nuggets Special Dark Chocolate available in a heart-shaped box; Available in a 7.4-oz. box (SRP $9.99). Hershey’s Kisses Deluxe 11-piece Marbled Cheesecake Flavor Chocolate Heart Box share the delicious taste of a dessert classic with special marbled cheesecake-flavored Hershey’s Kisses candies available in a heart-shaped box; Available in a 3.3-oz. box (SRP $5.99). Gifting Classics from Hershey Hershey’s Kisses Brand Milk Chocolate Conversation Candies Don’t just tell your sweetheart you love them; show them with Hershey’s Kisses Conversation Candies with messages of love right on the foils; Available in 11-oz. bags (SRP $4.39). Reese’s 1lb. Peanut Butter Hearts this Valentine’s Day, treat yourself and your loved ones to the perfect combination of milk chocolate and Reese’s peanut butter in a fun heart shape; Item contains 2 8oz. hearts (SRP $10.99).